"This tragedy was the predictable and predicted result of decades of unacceptable, greed-driven, and willful ignorance of safety," the suit says. The owners and operators of a duck boat that sank in Missouri, killing 17 people, put passengers' lives at risk by going out to water when severe thunderstorms were predicted, lawyers involved in a $100 million federal lawsuit argued Monday. "For 20 years, we have known that duck boats are death traps. It was proven yet again in devastating fashion in Branson, Missouri," attorney Robert Mongeluzzi said during a news conference Monday morning. "It is clear that they knew severe weather was coming and they tried to beat the storm by going on water first rather than refunding the 40 bucks that each of these people paid putting their lives at risk," he said, later adding. "This was not in any way a storm that came out of nowhere." 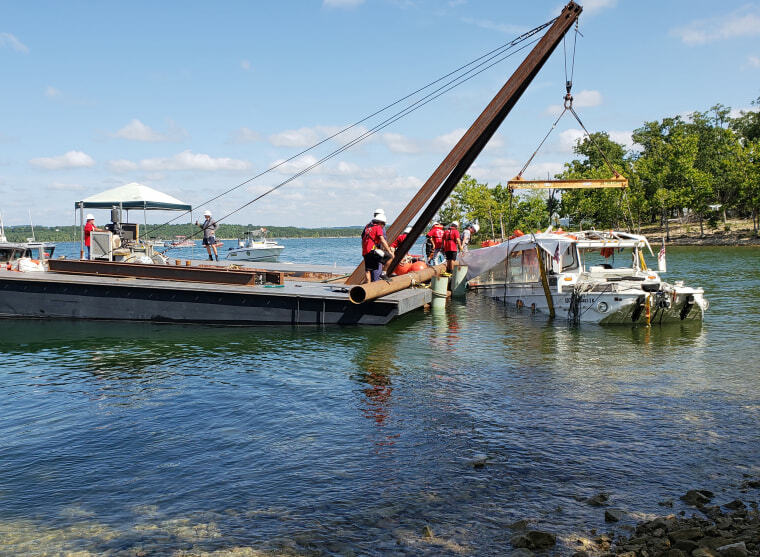 The suit was filed Sunday on behalf of an Indiana family who lost nine family member when the duck boat capsized during a thunderstorm on July 19 near Branson, Missouri. The wrongful death suit was filed by several family members on behalf of the estates of Ervin Coleman, 76, and Maxwell Ly, 2, who were killed. Five children were among the 17 killed, authorities have said, and another 14 were injured. Mongeluzzi said the family wants to know what happened, "Why did their loved ones die? And more importantly they wan to make sure that no one ever dies again inside a death trap duck boat." The suit alleges the owners and operators put profit over people's lives. "This tragedy was the predictable and predicted result of decades of unacceptable, greed-driven, and willful ignorance of safety by the Duck Boat industry in the face of specific and repeated warnings that their Duck Boats are death traps for passengers and pose grave danger to the public on water and on land," the suit said, noting that duck boats have been involved in dozens of fatal accidents. It also accuses Ripley Entertainment, Ride the Ducks International, Ride the Ducks of Branson, the Herschend Family Entertainment Corp., and Amphibious Vehicle Manufacturing of knowing that design flaws made the boats more susceptible to sinking and trapping people inside should a sinking occur. "Defendants had been told that design flaws in the Duck Boats made them more susceptible to sinking," the suit said. It also accuses the defendants of being repeatedly told to change the design of their boats to make them safer but ignoring those warnings. The National Transportation Safety Board has previously said that duck boat canopies present major safety risks as they essentially trap passengers in the boats when they sink. The legal team that filed the suit has been involved in a previous wrongful death case involving duck boats and has called for banning them since 2010. The suit notes duck boat accidents leading to deaths spanning nearly 20 years, including a May 1999 incident where 13 people drowned, a 2002 incident where four were killed and a 2015 incident where five were killed. Ripley Entertainment said in a statement Monday morning that the company remained "deeply saddened by the tragic accident that occurred in Branson and we are supportive of the affected families." Ripley Entertainment spokeswoman Suzanne Smagala said in the statement that the company could not comment further because the NTSB investigation is ongoing and no conclusions have been reached. The NTSB said Friday in a statement that they had completed an initial review of video and audio recordings from the boat accident. A log of what that video and audio revealed shows the waters went from appearing calm to waves and winds picking up in a matter of minutes. According to NBC News' Al Roker, storms had been forecast for the area on the day the boat sank. The lawsuit also alleges that during a safety briefing, passengers were told they would not need their life jackets. Tia Coleman, whose husband, three young children and five other family members died in the sinking, has said she believed her children could have been saved if she had been able to grab the life preservers. "The biggest thing that stood out to me is, no matter what, I felt like if I was able to get a life jacket I could've saved my babies," Coleman said. "Because they could've at least floated up to the top, and somebody could have grabbed them. And I wasn't able to do that." Angela Coleman, 45; Belinda Coleman, 69; Ervin Coleman, 76; Glenn Coleman, 40; Horace Coleman, 70; and 1-year-old Arya Coleman; Maxwell Ly, 2; Evan Coleman, 7; and Reece Coleman, 9, lost their lives. Later Monday, a separate wrongful death suit was filed by the children of Janice and William Bright, who died after the boat sank while celebrating their 45th wedding anniversary. That suit was filed against Ripley Entertainment, Ride the Ducks International and two duck boat employees and is seeking at least $25,000 in damages.